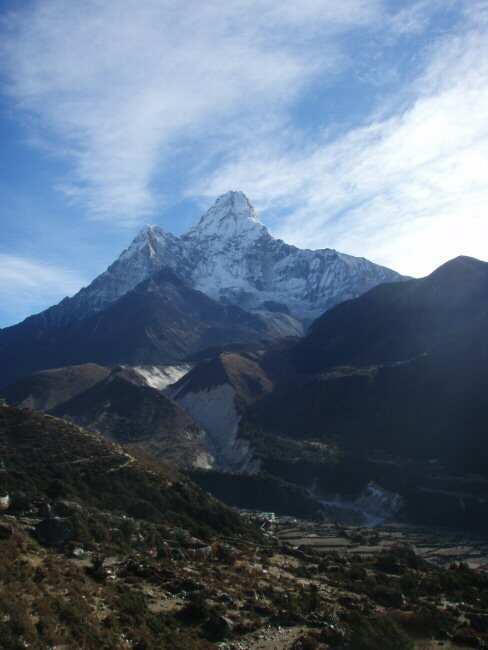 Today we return all the way down to Pangboche, rejoining the other part of the group. It is a long walk, but mostly downhill. I have not really recovered my energy, meaning that I can handle flat or downhill, but that uphill is a huge struggle. Paul has been having a sherpa carry his backpack, but I am determined to carry my own the whole way. They offer, when they see how tired I am, but I can carry it myself. After lunch, many of us lay down to rest. 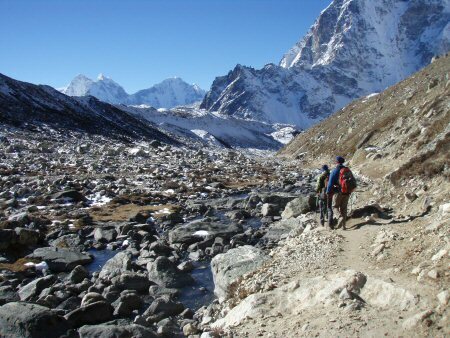 The whole day I am thinking about the last bit, where we have to climb 300 feet to the camp at the tip top of town. I am hoping against hope that there is another campsite farther down. 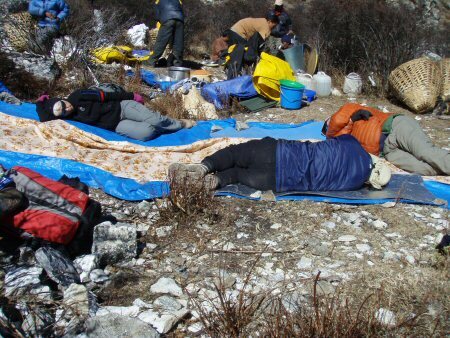 Well, no such luck: after a long hard day we have a stiff climb to get to camp. The whole party is kind of subdued: we put our heads down and trudge up to camp. The promise of warm, thick air to breathe is disappointing: at over 13,000 feet it does not seem any better than Lobuche. I force myself not to nap when we get in, so that I will have a better chance to sleep during the night. This pays off and I et a full 6 hours of sound sleep and seven more of fitful dozing and coughing. This evening we are treated to some kind of local festival, where a group of children goes around town singing at each house, soliciting gifts for the monastery. I got a recording from inside my tent.